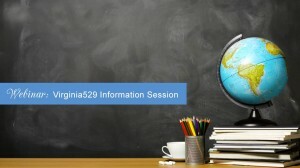 Learn about Virginia529 programs and how to use them from the comfort of your home. Tune in to a live episode and ask questions of the presenter or view an archived topic. New topics are available periodically. This session will walk you through the steps of using your Invest529 and/or CollegeWealth account. Topics include: communications you will receive from Virginia529, how to access important information you need in completing the FAFSA, responsibilities and deadlines, where your account can be used and for what expenses, and other various topics. This session will walk you through the steps of using your Prepaid529 account. Topics include: communications you will receive from Virginia529, how to access important information you need in completing the FAFSA, responsibilities and deadlines, where your account can be used and for what expenses, and other various topics. Learn how to save for higher education during this college savings information session. In just one hour, you’ll learn the features and benefits of the Virginia529 programs. These programs help you prepay tuition and save for other costs, such as housing, meal plans, textbooks and more, and receive tax advantages on the money saved. 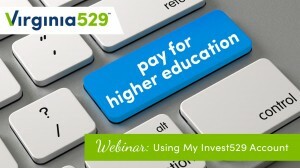 This session will guide you through the process of using your Invest529 account to pay for higher education. This session will guide you through the process of using your Prepaid529 account to pay for higher education. 12:00 p.m. - 1:00 p.m.
Do you want to continue to the third-party site?